In a few more weeks, we’ll see whether they’ll actually flower. They all made it through the winter, though, which was the first hurdle. Despite the very cold nights and chilly days, I can tell – summer is coming. Well, the tulip bulbs are now in. While other people battened down the hatches for Hurricane Sandy (which thankfully did nothing to us) we dug up an area of approximately 50 square feet in the front yard around our crabapple tree. I added bulb fertilizer to the entire area, then I placed all the bulbs in the pit according to the plan I had developed. There are 11 types of tulips, ranging in height from 10-12″ up to 24-26.” So I needed the plan. 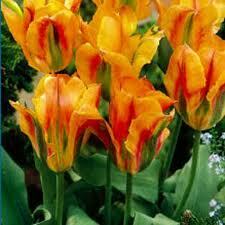 I have always loved planting spring flower bulbs. Even as a teenager, passing by displays at the local nursery or in Home Depot, I would stop to see what was available and more likely than not, pick up a package to put in the ground. Daffodils are my absolute favorite flower, but I also really love tulips. This past April, J and I took a visit to the Netherlands for our April anniversary. I have always wanted to see the tulip fields. Interestingly, tulips are not native to the Netherlands – they were imported by Ogier de Busbecq, the ambassador of Ferdinand I to the Sultan of Turkey around 1554, and spread across the continent. For some reason they took off in the Netherlands. As our flight was landing at Schipol Airport, you could see these huge swaths of color dominating the landscape. It was every bit as amazing as I thought it would be. Keukenhof very thoughtfully has several tulip vendors situated within the park, where you can view their color catalogs of tulip bulbs, make your selections, place your order, and those vendors will very helpfully ship those bulbs to you in the fall for planting. It’s not legal for you to pack the bulbs in your luggage because they must be inspected by USDA inspectors before shipment to the United States, and if you had to carry them back in your luggage you might feel more restrained in your purchasing. 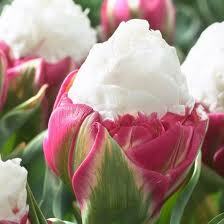 By simply filling out the order form and handing over your credit card, buying tulips is virtually painless! I will say that these bulbs appear to be the healthiest I have ever purchased – a quick inspection shows they are free of bug damage, rot and mold that have plagued purchases I have made in the U.S. I would hope they would be a higher quality, given the cost associated with them. However, the tulips were ones I had never seen here in the U.S., so they were worth it. To me, anyway. I can’t help but think that in 16th century Amsterdam, I might have been a victim of tulip mania. Probably not, though. I don’t play the stock market now, so I would have been unlikely to speculate on the value of something I would be most interested in planting in the ground. We did not grow the hanging baskets – they were purchased Memorial Day weekend from a nearby nursery. I need to find out what the large green leaf plant is – it fills in the basket nicely as petunias get pretty leggy by August and the baskets still look great. Originally we had planned to have hanging baskets of snapdragons, but the type of snapdragons – Lantern – really did not look anywhere close to good by Memorial Day, so we made the substitution with the nursery baskets. The extremely tall flowers are dahlias. I have never seen dahlias get quite so tall. I was forced to tie all of them up with stakes due to their weight and the fact they were tipping over and covering the cosmos, geraniums, double petunias and aquilivia that I also put in the pots. So I have an extraordinarily busy schedule for this week and next after work. 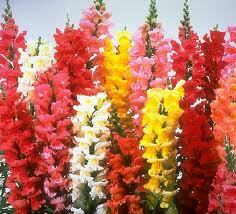 Unfortunately, we are in prime seedling starting season, which means that poor J had to start my snapdragons. Snapdragons are native to North Africa and the Mediterranean, and are apparently incredibly fussy when it comes to getting them started. The package directions say to sow them in vermiculite, and to only sow them on top of the soil and not to cover them as they need light to germinate. They also need cooler temperatures, so they can’t be placed on a heat mat. After sprinkling the seeds on top of the soil, they need to be misted lightly with water and monitored – they can take up to three weeks to germinate. I picked about 4 different colors to grow, plus a type that drapes so I can grow my own hanging baskets this year. The geraniums, apparently, need a completely different starting process. We’re apparently already behind the 8-ball on this one, as many online gardening sites suggest sowing the seeds by mid-February for a mid-May planting. The particular brand I selected this year requires soaking before planting. Geraniums are sown into the soil and then thoroughly watered from underneath rather than sprinkling water on the top of the cells.﻿ They need a lot of light and temperatures between 70-75 degrees during the day and 55-60 at night. Under the right conditions, they will germinate in about 7-10 days. Ours germinated in two days. Two. And two of the five planted seeds germinated the next day. Moral of the story? Don’t believe everything you read on the internet; sometimes it’s wrong. So our new concern is not killing them. After all, this was the most expensive package of seeds – $2.25 for 5. But a potted 4″ geranium retails for $3.99 around here, so if we can keep them alive, it’s a significant savings. When we were placing our seed order, J told me that he was going to put all the flower seed starting in my hands. So far he’s done all of it. What a guy! Of course, if this is successful, I will be unable to say that I grew all my own flowers from seed, because that will be categorically untrue as I have thus far done none of the work. In August, when the gardens look great and my flower containers are at their height, I am always enormously pleased with how wonderful everything looks. I forget what a pain in the you-know-what this is to get going.